I decided to play around with some of the sheets of my left-over Sweet Sorbet dsp. I find that I tend to favor about half of the sheets in any dsp collection. I may like most of them, but only about half end up being my “go-to” sheets, and the rest just don’t get used very often. I need to be better about using them all! I also pulled out my Fun Flowers die. I haven’t used it in quite a while, and I love it. I curled the petals a little with my bone folder. The Thank You pennant is from the Good as Gold Simply Sent Kit. 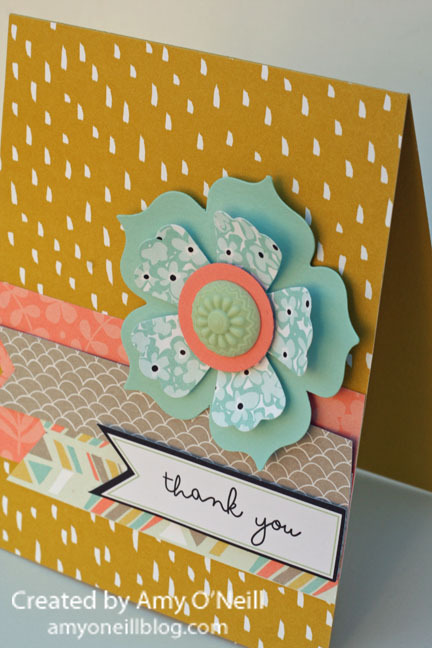 There was no stamping on this card (gasp!). But it was still fun to make. This entry was posted in Fun Flowers die. Bookmark the permalink. I didn’t like this Crushed Curry paper at all until I saw your card! It’s beautiful! Love the combination of papers. Still trying to decide whether to get another pack of dsp or the Good as Gold set with my last SAB order.